If you've gotten a ticket, you probably want to put it behind you. There is no faster way than with our quick and convenient online course. Automatically reported - no waiting for a certificate! Have you received a California traffic citation? Don't let that mistake add points to your driving record! With an online CA traffic school course, you can keep that ticket hidden almost as fast as you were driving when you got it. Quick and easy - Complete it from home! Poking around the Internet you will find many courses for ticket masking and insurance premium reduction. However, it is vital that you choose one that has been approved by the California DMV if you wish to accomplish either of these tasks. Even though all California traffic schools must cover and teach the same information, we understand that everyone doesn't learn the same way. Because of this, we offer our course into different formats. 1. The Text Based Course - You will receive the state required information in an easy-to-read text format that makes it easy to work through the course at your own pace. This is the most affordable way to lower your insurance or mask your ticket. 2. 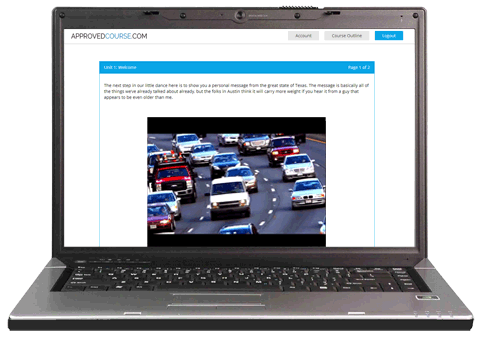 The Video Course - You couldn't ask for an easier way to fulfill your traffic school requirement than to watch our video course. Learning the required subject material in the form of a 3-D movie makes our traffic school course as easy as watching TV. Let's face it. Who has time anymore to devote several hours to travel to a classroom and listen to lectures in the midst of their busy schedules? With an online course you are free to work on the material at a pace that works with your schedule. Log in and out as often as you like, we'll save your place. You can complete your course across platforms as well. Start on your iPad in the morning, moved to your desktop in the afternoon and then use your smartphone in the evening. Simple, easy, convenient. Choosing to take your course online really is the better way! It's more than making amends for a traffic ticket, there are other benefits from attending a traffic school course. Many insurance providers offer discounts to policyholders simply for taking a the course voluntarily. Check with your agent to see if taking our course will qualify you for a safe driver discount. It's like getting paid to go to traffic school. When you have finished your course, the DMV will want to see proof of completion. As soon as you complete the course, we will get to work reporting your completion directly to the DMV. You don't have to worry about collecting a certificate, getting a stamp or making a trip to the DMV yourself, we take care of all the work. If you would like a copy for your own records, we make that easy by allowing you the access to your completion certificate right from your computer. When you sign up your course, we don't leave you on your own. We pride ourselves on our great customer service. We are here 24/7 to help! There are many benefits to taking a California traffic school course. The first of these may be the one that probably brought you to us in the first place, masking a traffic ticket. Masking a ticket may keep your insurance rates from going up. Not only that, going to traffic school could actually make your premiums go down thanks to safe driver discounts. It doesn’t matter why you are taking the course; just make sure that you are taking the right one. Whether you are taking the course for ticket masking or an insurance discount, to qualify for either the course must be licensed by the California DMV.